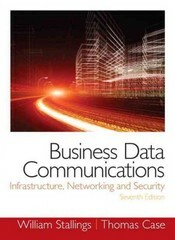 Business Data Communications- Infrastructure, Networking and Security 7 Edition For Business Data Communications, Data Communications, and introductory Networking for Business courses. T he content is also appropriate for the Introduction to Networking course in a MBA program. Business Data Communications: Infrastructure, Networking and Security covers the fundamentals of data communications, networking, distributed applications, and network management and security. These concepts are presented in a way that relates specifically to the business environment and the concerns of business management and staff. While making liberal use of real-world case studies and charts and graphs to provide a business perspective, the book also provides the student with a solid grasp of the technical foundation of business data communications. The diverse set of projects and student exercises enables the instructor to use the book as a component in a rich and varied learning experience and to tailor a course plan to meet the specific needs of the instructor and students. The Seventh edition features a new co-author, Dr. Thomas L. Case, Professor and Chair of the Department of Information Systems at Georgia Southern University. New coverage of security-related issues is included in relevant places throughout the book to meet the needs of the IT/IS schools using this book and the growing emphasis on network security. Additionally, the Seventh edition now aligns with the ACM/AIS IS 2010 curriculum model.